The new version of Henshin comes with an extended transformation language with support for specifying Java imports and annotations, and a couple of new utility APIs. Besides the changes under the hood, the 1.0 release also comes with a number of visible new features, including a reworked interpreter wizard and new preferences for the diagram editor. 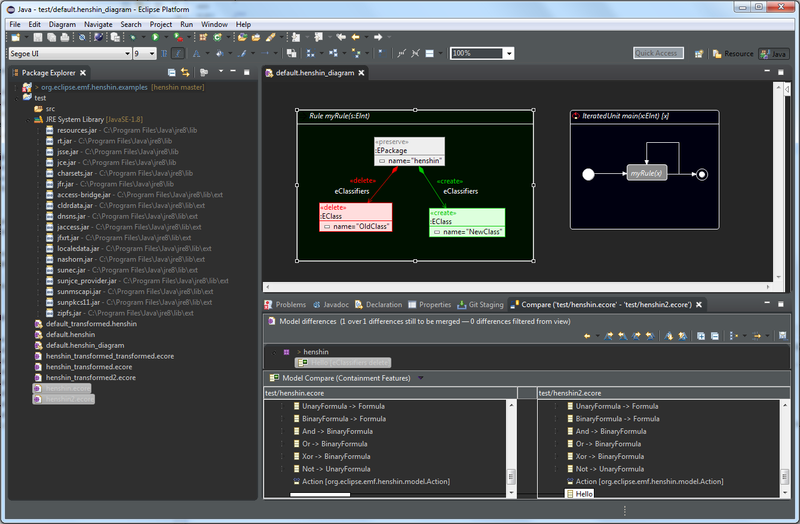 As an eye candy, we also added a new color mode for the diagram editor which goes well together with Luna's Dark theme. You can obtain Henshin 1.0 from the release update site or clone our Git repo to try it out! And of course we've build a critical bug into the release! Anyway, the fixed version is available at the release update site. What exactly happens? Do you see error messages in the Error Log? please check the latest version at the release update site. The problem should be fixed now. Let me know if you still get strange behavior. first of all sorry for not giving a detailed error description. Thanks for finding and fixing the error, we're happy with it now. However, the preview feature of the transformation's result is gone in 1.0 (in the wizard)? We found this one very helpful in the past. You still get a "preview". Just apply the transformation -- the result will be written to a new file and if you keep the "Open Compare" checkbox selected, the EMF Compare editor will open up automatically. Hope this helps.